A nutritious nut with an irresistible flavour, the pistachio is actually a seed kernel grown principally from the Pistacia vera tree. This tree has several cultivars; but, the most common is the kerman, from which the nuts are typically harvested. A member of the cashew family, Anacardiaceae, the pistachio tree is native to Central Asia and the Middle East and grows in the arid, saline soil of the desert. As a desert plant, pistachio trees grow best in hot, dry climates and are harvested between late August and early October. Pistachios are a good source of protein, potassium, copper, and phosphorus. Pistachios are a rich source of phytosterols, plant-based compounds that have been proven effective at lowering blood cholesterol levels. Pistachios are a good source of amino acids, the building blocks of protein. In particular, pistachios are rich in L-arginine, which is capable of improving blood flow in clogged arteries and is essential for supporting the body’s metabolic processes. 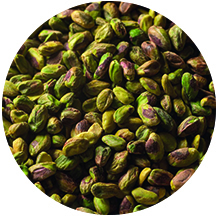 Pistachios are enjoyed for their unique nutty taste, their excellent nutritional value, and their versatility with a wide range of culinary applications for the pistachio all over the world. From snacks and salad toppings to ice creams and other sweet treats like baklava, Turkish delight, and nougat- the nut offers a compelling component for countless dishes thanks to its rich, distinctive taste.